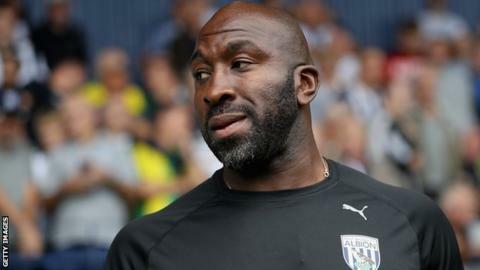 West Brom boss Darren Moore is calling on football to unite to stamp out the “ugly” spectre of racism. In the wake of Saturday’s incident involving Manchester City’s Raheem Sterling at Stamford Bridge, Moore says he feels the game needs to act because it has “become complacent”. Moore is one of just eight black managers in the top four divisions of the English game. “We are nowhere near where we thought we were,” he said. England international Sterling, 24, was allegedly racially abused during Manchester City’s 2-0 defeat at Chelsea on Saturday. Chelsea and the Metropolitan Police are investigating the allegations, with the club suspending four supporters from all their matches until they have reached a conclusion. On Tuesday, Bournemouth defender Tyrone Mings pulled out of a radio interview on Talksport in protest at how the story had been covered during a discussion involving former Reading striker Dave Kitson. Moore, 44, made more than 600 appearances during a 20-year career that included spells at eight clubs, including West Brom and Derby. He took over as Baggies manager in April following this dismissal of Alan Pardew. Although he could not save the club from relegation, he was appointed on a permanent basis the following month. Moore accepts progress has been made in the fight against racism but feels ‘isolated incidents’, such as the one on Saturday, have gone unchecked. He also backed Sterling for highlighting discrepancies in the way the media dealt with two stories about City team-mates Phil Foden and Tosin Adarabioyo buying houses. Foden, who is white, was portrayed positively, while Adarabioyo, who is black, was not. Moore said: “In terms of the views on both players he named, the way Raheem articulated himself was spot on. He has a point. “Everyone, the governing bodies, the clubs, the media – we have to get clear, open messages out there and educate people. “These isolated incidents have gone on far too long. We should not condone what is happening in the stands of our clubs. Moore is passionate about fighting racism, to the extent he has switched off rap music in the West Brom dressing room that contains words he views as offensive, on the grounds that if one person within earshot is upset by it, then it cannot be allowed. On Wednesday, Moore attended the opening night of a play ‘1978’, performed by children at the Sandwell Academy, which is near The Hawthorns. The play is based around the experiences of three black former West Brom players: Cyrille Regis, Brendon Batson and Laurie Cunningham. Moore said: “It will be interesting for me to watch those children perform a powerful play.